A few weeks ago, i have been with my family at the international mall in Tampa. We went there to the Apple store to look at the airbook from Apple. The store was pretty busy and we had not chance to get to one of the notebooks, so I decided to show my wife the new iPod nano with an idea I had. The iPod nano is the same size like a wrist watch and i told her if we put a band on it then it is the perfect wrist watch. The build in clock looks even like an vintage finger watch. She agreed and said this is a great idea. We left and at home I opened kickstarter.com in my browser. Kickstarter is a great platform. Inventors can promote their ideas and the community can support (be a backer) the idea with donations. The donated money does not leave the account till a predefined total amount is reached to a defined date. I thought i use kickstarter to promote the idea because my cash is low :), but before i decided to look if somebody else had this idea. And a simple search i found a design company (MINIMAL) which did already post the idea I had, but with already a very nice design and two different versions. 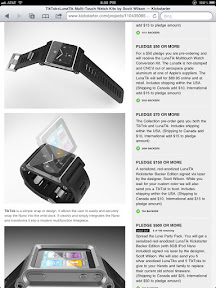 My idea was taken, but their design idea is so beautiful that I pledged for the product ($25). Which is no risk at all. I thought either they don't get the money they need, then i get my money back or if they get the money i will get two wrist bands. It is a win win for me and them. When i did this, the total pledge was $20k. By today it is $556,048. Never before did a kickstarter project get so much pledge. But, besides that the offered wrist band is totally cool, the guys who started this project did everything right. They had a very good description of the product they want to build, they had a video animation of the wrist bands which was very appealing. A perfect CAD animation. They offered 6 different pledge packages (all but the $1 deal) will give the backer in return more than the product will go to sale. If you pledge $25 you get the band which will be sold later for $34.95. They did not only have good offers, they did as well very good marketing. Press releases and regular emails to the backers. We backers could give our opinion and they listen and implemented some of the ideas. 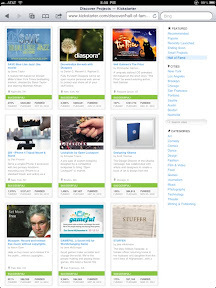 If you look at the hall of fame at kickstarter, you will see that the top 10 ideas together (including ipod wrist band) collected over $1.7 million and all of them have a similar method to get the necessary money and more. All of these products are unique and targeted at a niche group. Apple fans, anti Facebook users, people who like certain authors or producers etc. They all have professional looking videos about their project. The story they tell is appealing, even if I would never pledge for some of the hall of fame projects, i still like their story. Users have the choice of different pledge amount and getting something in return which seems to be same amount as they donate. 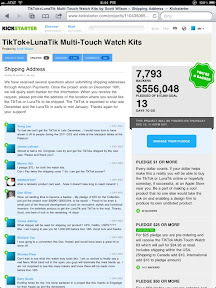 A good kickstarter project owner will send constantly updated to their backers and will have multiple press releases. Backers feel that they are a part of the project and can influence the project by pledging money and formulating their ideas. If you have an idea for a product and you don't have the money to do it yourself and no connection to VC and you follow all these steps then kickstarter.com is the right tool for you.